Schools everywhere (especially in the UK) are suddenly finding themselves coming under serious pressure to switch to a widely adopted (well over a thousand schools in the US alone) “Core Knowledge” curriculum based upon teaching facts rather than skills. This trend is based upon a theory called Cultural Literacy, advocated by Eric Hirsch. What Hirsch claims is that schools are failing to ensure that this knowledge is being imparted, resulting in ‘culturally illiterate’ school leavers who are (alarmingly?) unable to understand much of what is being said in public and in the media. This return to a ‘back to basics’ fact-based teaching approach, which its critics delight in pointing out was remorselessly pilloried by Charles Dickens in his 1854 book Hard Times, is being aimed at overcoming what its supporters claim are the shortcomings of the ‘modern’, post 1960s emphasis on skills-based teaching. It claims to be able to do this by replacing time ‘wasted’ on the ‘misguided’ teaching of skills (which is an approach which includes, at its most enlightened, giving learners the skills which would enable them to work things out for themselves). The Hirsch scheme requires a curriculum-mandated body of ready-made, ‘uncontroversial’ officially-approved facts that a school (which has decided to adopt a core knowledge curriculum) believes are necessary for the learners to know in order to be able to correctly interpret communicated meaning. We know that there is a particular contingent of educationalists for whom arguments on both sides of this debate are treated with equal scepticism, not because they necessarily wish to deny their importance, but because they feel they are based upon what is perceived to be an invalid assumption. An old question, about to be given new urgency? They question the assumption that teaching, when it is imposed upon learners who have no say in what or how they are taught, produces the highest attainable proportion of satisfactorily educated citizens capable of leading fulfilling lives and making a valuable contribution to society. These sceptical educationalists lay the blame for the widely recognised failures of current education systems squarely upon the fact that these systems are not predicated upon a requirement for the learner to be actively involved in shaping their own learning experience, a requirement which these critics of the current ‘received wisdom’ of ‘impositional education’ see as absolutely essential to securing the necessary level of motivation of the overwhelming majority of learners. They see that by failing to secure the required level of motivation in this way, only ‘highly predisposed’ learners, a minority for whom motivation is not an issue, actually receive the intended education, leaving the majority (who are not highly predisposed to accept or learn from imposed teaching) not merely under-educated in both skills and facts, but unmotivated towards remedying any shortfall in their education, primarily because they either see themselves as incapable of being educated, or because they dismiss the value or relevance of education to their own circumstances. 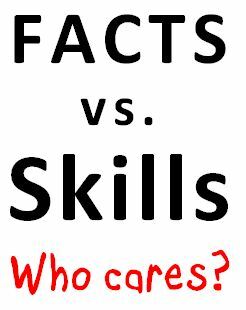 In the context of the facts vs. skills debate, the ‘education imposition sceptic’ feels duty-bound to insist that the resources and responsibility for choosing the right approach to this and all the other educational options should be placed into the hands of the learners themselves. What, let the lunatics run the asylum? At this point in the argument, traditional educationalists (especially fact-based cultural literacy advocates) can be expected to raise their hands in horror. They would claim that learners cannot be allowed to decide such issues for themselves, if for no other reason than that these uneducated individuals cannot, by definition, be expected to be in possession of either sufficient skills or facts required to make fully informed rational judgments regarding their own education (or indeed anything else) based upon the merits of the case, and that anyone who believes that uneducated learners are fit to do so is also self-evidently unfit to influence the direction of educational policy. The problem for the impositional sceptic is that up until now, efforts to demonstrate the positive impact of ‘elective’ educational approaches upon the motivation of early learners have been constrained by a serious lack of investment in either research or deployment, a state of affairs generally attributed to an entrenched adherence to a ‘safe’ traditional impositional approach in the mainstream educational establishment. The video below reveals findings which make a complete mockery of impositional education, by successfully overcoming (and holding out the prospect of ultimately eradicating) its most notorious shortcoming, namely the seemingly intractable hopelessness of countless disenchanted struggling learners. For years, researchers have known that games can break down the very kinds of motivational barriers that impositional education introduces and perpetuates. However, not even the most outspoken and long-standing supporters of games-based education are expecting a mainstream educational establishment move towards greater institutional acceptance of their favored approach any time soon. Expecting teachers, schools, or education authorities to incorporate a requirement for competence in developing new games into their remit has never been seen as a realistic option, probably on the grounds of the sheer cost (or unprecedented audacity/risk/backlash) of even attempting such a thing. Expecting even a single example of a game which could potentially overcome such objections is a tell order. For a game to be good enough to be used as a means to fully overcome serious motivational shortcomings (in a way and to an extent comparable to that described in the video below) and to also have widespread application and adoption would take a commitment to addressing such requirements in this way to a level well beyond the remit and resources of even the most dedicated, experienced and competent bunch of classroom teachers and closer to such things as major software publishers’ commercial endeavours and large university research programs. There are often hundreds and sometimes even thousands of facts and often dozens of skills required to be learned for each of the subjects in a school curriculum and such statistics offer an insight into the scale of perhaps the greatest challenge to games-based education, in its role as a response to motivational shortcomings of other teaching methods: the sheer number of games that are required. These issues and more constitute ‘the games-based education barrier’ which probably accounts for the Cinderella status that games-based education has had over the years. So although games are a proven fix for educational motivation in particular subjects (notably mathematics) nobody has seen the development and deployment of games as anything more than a tactical, rather than strategic educational issue. Despite the fact that the games covered in the research mentioned in the videos include major (non-educationally targeted) titles, produced at great expense, it is actually not the games themselves that are directly responsible for the learning phenomenon that is being observed. It is only recently that educators and psychologists have being paying serious attention to games culture as a separate learning-related phenomenon in its own right. What they begun to explore are what they are calling the ‘affinity spaces’ where fans of a particular games congregate (often independently of the games publisher) in online communities exclusively dedicated to the game in question. These communities essentially dedicate themselves to an unrelenting effort to take the game far beyond anything its publisher has (or possibly could have) provided. It’s probably worth considering what it might be about the nature of the particular types of games in question which could possibly produce a culture which in turn encourages what can only reasonably described as an obsession with scholarship, an obsession so intense that it causes players to go to the effort of creating or contributing to these affinity space communities just so that they can acquire even more knowledge and skill than the more than ample resources (which are often already formidably sophisticated) provided by the game itself. Certain types of games provide the facility for players to create extraordinarily detailed and sophisticated ‘worlds’ as spaces within which to play the game. Such games require you to play them by responding to challenges within an environment which is partly constructed by the game publisher’s own developers and partly constructed by other players. It is the uniquely intricate and intensive knowledge and skill requirements which emerge from this aspect of such games, the requirement to master ‘world creation’ and ‘navigating worlds created by a community of peers‘ which in turn generates an insatiable demand among the players to acquire and exercise knowledge and skill in order to be able to overcome such challenges and to create such challenges for others. Well, although this ‘player-created worlds’ challenge may explain the demand for knowledge and skill within the games, it does not explain how such knowledge and skill is acquired and more particularly how it is acquired by those whom Eric Hirsch would have written off as being insufficiently culturally literate to be able to understand the Byzantine fact-and-jargon laden literature that such players need to read in order to attain the mastery to which they aspire. So how do unquestionably culturally illiterate players somehow manage to rapidly acquire the level of cultural literacy that they need to be able to successfully interpret and understand these arcane texts? Questions like this one have formed the basis of the research covered in the videos. The findings include such things as the discovery of ‘on the fly self correction’ as a key feature of the behaviour of the struggling learners who manage to ‘remediate’ their own illiteracy, yet whose transformation inevitably remains ‘under the radar’ of an education system whose awareness of the impact of games culture on educational motivation is conspicuous by its absence. There seems to be a critical nexus between education, games culture and overcoming seemingly insurmountable learning motivation problems. We have either been trying to impose skills, or facts or even trying to create games, in order to overcome something which it turns out, none of those seem to fix. But something about games culture and its affinity spaces certainly does fix it. James Paul Gee has been talking about the implications of the educational role of affinity spaces in the future of games design. What the videos below reveal, is that there is a role for this aspect of games culture in the future of mainstream education. what do we need to do in order to understand game culture well enough to work out how to use it to address the shortcomings of our broken education system? will struggling learners bypass the established education system and educate themselves? will learners in the third world use a combination of game culture (for motivation) and free course materials available online (like Coursera) to educate themselves enough to ultimately overtake a motivationally-challenged and consequently under-educated first world population? Constance Steinkuehler, a games and learning scholar, discusses her firsthand experiences in seeing how youth-centered learning and online gaming leads to compelling turnarounds in youth engagement. Kurt Squire, video game designer and assistant professor at the University of Wisconsin-Madison, breaks down the educational power of video games for digital-age learners.